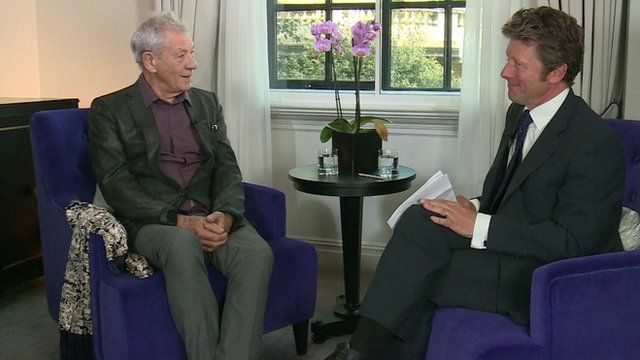 McKellen does 'Holmes thing' on presenter Jump to media player Actor Sir Ian McKellen makes some Sherlock Holmes-like deductions about BBC presenter Charlie Stayt during an interview about the film "Mr Holmes". Gandalf offers pupils exam advice Jump to media player On a visit to a school in Somerset, Sir Ian McKellen reprises his role of Gandalf the wizard to offer pupils an exam tip. British actor Sir Ian McKellen has played comic book villains, Shakespearean kings and a bearded wizard called Gandalf. Now he is turning to Sherlock Holmes. In "Mr Holmes" he plays the fictional detective in his later years, struggling to come to terms with the unsolved case that forced his retirement. Sir Ian revealed his own powers of deduction to the BBC's Charlie Stayt - and revealed why he was wearing slippers.